We are a group of people in the greater Fort Myers, Florida area who are interested in Model Railroading. We have among our membership people with a wide range of experience in modeling, from beginners to Master Modelers. We are constantly working to improve our HO, HOn3 and N Scale layouts. We are always open to new members. Feb 15-16, 2020 at Araba Shrine Temple. Club membership is at 46 members. Welcome Al Sloan. Those that arrive early please park in the rear and side to help with our limited parking. This is mainly an issue during winter season. Hours: Tuesday and Saturday; 10:00am to about 2:00pm. Admission: Free. Donations always appreciated. Often trains are not running during the lunch hour 12-1. Might have a video playing. ** Normally on the second Saturday of each month we have a business meeting from 11:00am-12:00pm. During the meeting we are closed to visitors. Directions: We are in North Fort Myers, at 1262 Piney Road. It is easiest to take business 41 to Pondella Rd (west). We are just before Rt. 41 and in back of the Speedway station. Turn right on Piney Rd, then 300 feet on right. 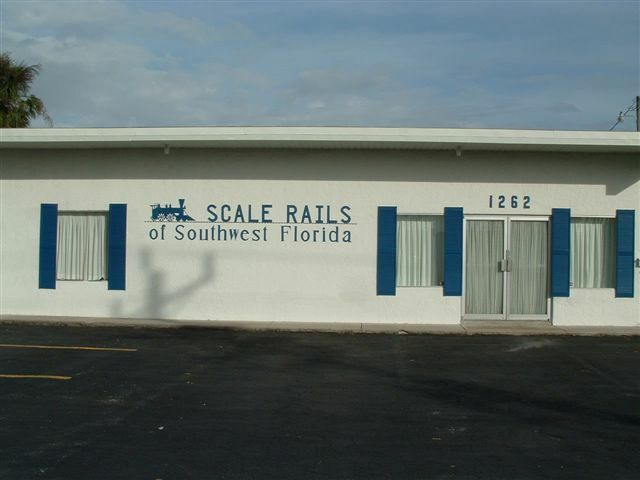 All members of Scale Rails of Southwest Florida are also members in the National Model Railroad Association, and the Sunshine Region. For more information about these organizations please go to their web sites, which can be reached by clicking on their names in our menu to the left side.